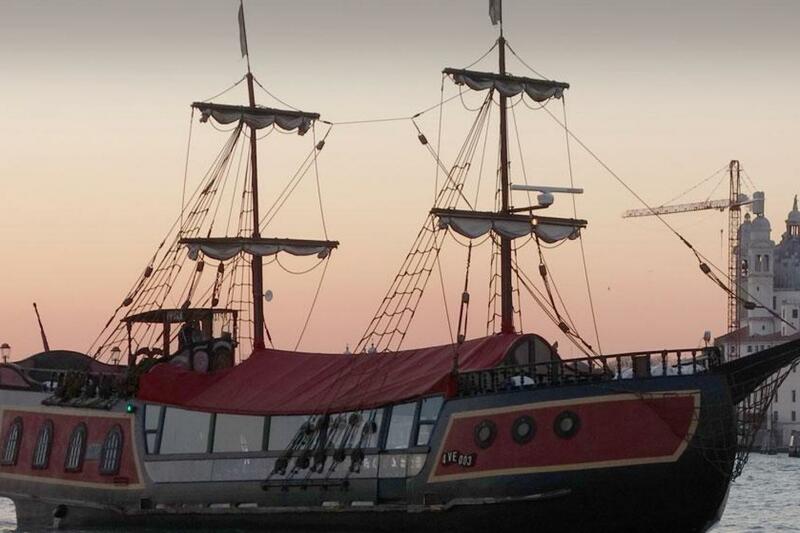 The Venetian Galleon will be waiting docked on the shore of the Venice wharf in front of the Naval Museum where the crew will be ready to welcome you on board and take you to the reserved tables where you will be served a pleasant welcoming cocktail. 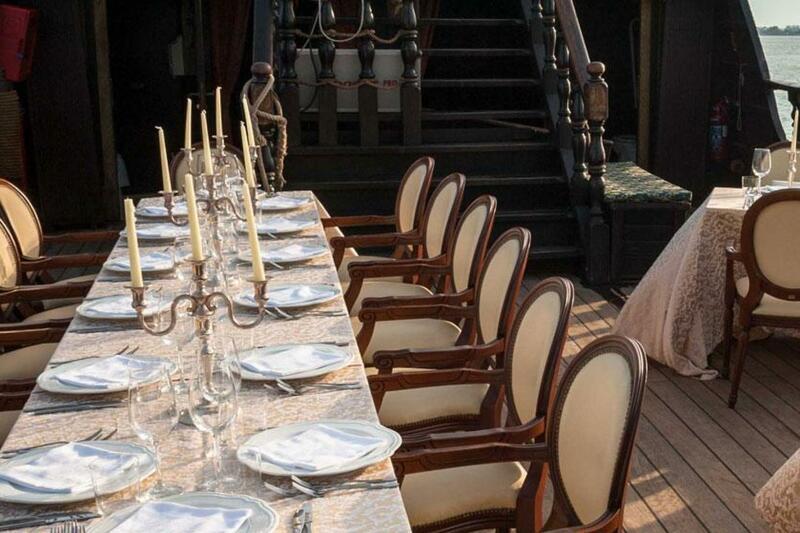 The sensuality of candles, the elegantly laid tables, a careful but unobtrusive service and the charm of a boat of other times will complete the overall appeal of an unforgettable dinner in the seductive atmosphere of the Venetian lagoon. At the first lights of the evening, the Galleon will slowly start moving off towards the north part of the lagoon with its mysterious canals, as the succession of smaller islands as Sant’Erasmo and San Francesco del Deserto appear one by one. You will savour the specialties prepared by our Chef whilst sailing towards Arsenale and then alongside the islands of Le Vignole, Murano, well-known throughout the world for the masterpieces of its glassmakers, and Mazzorbo, moving on to circumnavigate Burano with its characteristic coloured houses and its leaning bell tower. 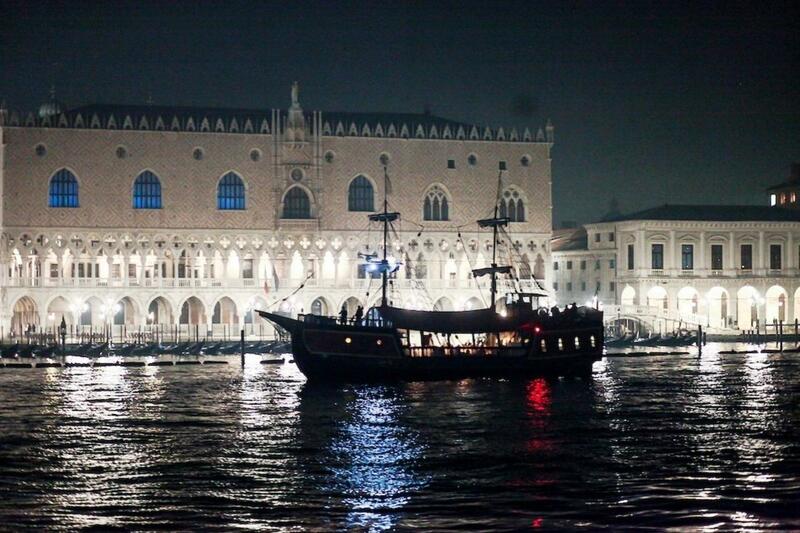 Sailing back towards Saint Mark’s basin, the Galleon will reach the small island of San Giorgio, in a series of lights reflected in the water, pleasantly immersed in an atmosphere that will be able to entrance you with evocative emotions. 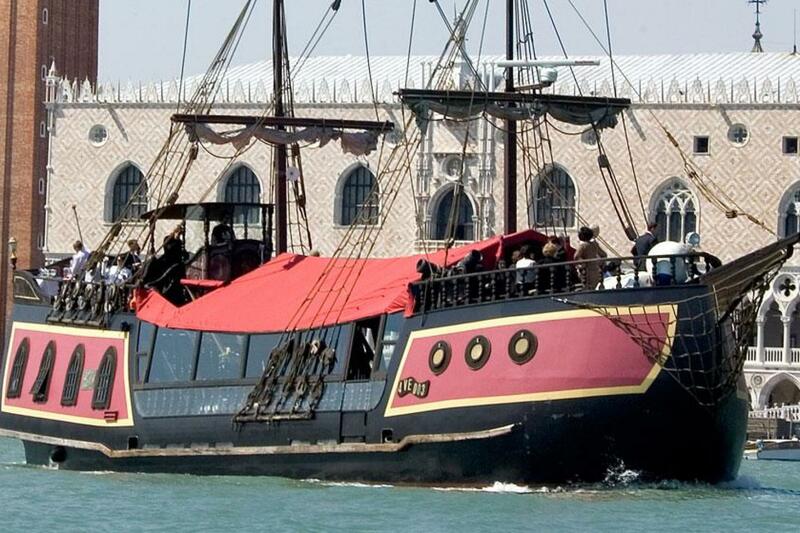 The Galleon will then head towards Venice and, while sailing alongside the Canal of Giudecca, you will see a breathtaking view of Saint Mark’s basin and of the historical palaces and hotels of the ancient city. 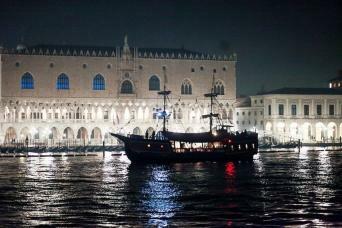 Once arrived at the landing point in front of the Museo Navale, with a last glance at Venice, we will say goodbye to you hoping of having made your stay in this splendid city even more magical. Scenic view of Saint mark's basin and the historical palaces and hotels of the ancient city. Please inform us of any food allergies or needs in advance. An alternative menu will be offered that you should reconfirm. The suggested menu is subject to change and all selections are subject to availability.